The star of Lord of the Rings and the recently screened Alatriste radiated warmth in his jaunt through Chile. With his marked Argentinean accent and his mate at his side, Mortensen lunched at El Mercurio and talked about soccer, his polemic criticisms of Almodóvar and about how to be humble in Hollywood. Last Monday, just after getting off the plane that brought him from Mexico to Chile, Viggo Mortensen, Hollywood star of Lord of the Rings, suddenly realised he should have been a better actor when going through customs. He narrates the story just so, in perfect Spanish, hours after arriving in the dining hall of El Mercurio. "The customs agent looked at my American passport and asked me in tortured English how long I was planning to stay in Chile," he says about one of the many airport scenes he's played out during the Latin American promotional tour for his latest movie, Alatriste, the big screen adaptation of Arturo Pérez-Reverte's novels, which brought him to our country for just slightly more than a day and premiered this week. "So I answer the agent in Spanish," Viggo continues with his anecdote. The film's director, Agustín Díaz Yanes, and his co-star Ariadna Gil, listen. "And when I speak, the Argentinean accent escapes. So then the agent looks at me severely like, "Argentinean with an American passport?" But everything changed when a friend told him, "Hey, calm down, he's the guy from Lord of the Rings." They gave me a warm 'welcome to Chile.'" Allowing him to cross all filters and frontiers, Peter Jackson's movies based on Tolkien's novels, have transformed him into a global personality. Without limits. Sporting hair gel and a San Lorenzo de Almagro t-shirt depicting his beloved team (Danish father and American mother, he grew up in Buenos Aires), Viggo was out at 8:30 am in Santiago's airport, calmly taking pictures with taxi drivers. He accepted his delayed arrival at the hotel without complaints. Without the hauteur which one could expect from a guy who has had a 25 year career in Hollywood, during which he has shared screen time with Al Pacino (Carlito's Way) and Michael Douglas (A Perfect Murder) and who, unexpectedly, has been touched late in the game by elusive glory, which has yet to relinquish its hold. "Viggo is a total artist," certifies Díaz Yanes, director of the most expensive movie in Spanish film history (45 million euros). Viggo, a lot has been said about your Spanish accent in Alatriste. Was it difficult to achieve? "Well, I was afraid of failing because it was Spanish-Spanish, the really traditional kind, and I had to get it perfect. I was at the side of the best actors in Spanish film and theatre and I felt an enormous responsibility. But you know, it was comfortable. I learned Spanish and English at the same time as a child, growing up in Buenos Aires. My brothers have told me that when I speak Spanish I'm slightly more relaxed. When I speak English I'm a little more careful. It has to do with the sound, with the language, for example like with the character of Alatriste: he's terse and that affects the manner in which your body moves." Viggo has said that, unlike Alatriste, whose speech is reserved, he sometimes says things without thinking about them too much. He's impulsive this man, 48 years old and the cause of commotion when the Spanish press, which now considers him a part of the Spanish star system, published his criticisms of the untouchable Pedro Almodóvar for not attending the Goya awards. Was he angry with you? "I don't think that Almodóvar will have trouble doing interesting things even if I or another person have an opinion about what he's doing." Simple, humble, politically correct. Ariadna Gil, who is having a piece of Chilean meat as her main dish, talks about the equality with which Viggo treats everybody on the set. "He brought us candy every day, delicious candy. You don't expect that from a Hollywood star. What were those candies called, Viggo?" "Alfajores, Ari, alfajores", says Viggo. "They're common in Argentina and the truth is that I was surprised to find alfajores in Madrid when we filmed Alatriste. And it also scared me. During the preparation I realised that half of Madrid were Uruguayans or Argentineans. I ran away like Edvard Munch's painting The Scream." You wanted to maintain the Castilian accent. "Of course, and hearing Argentineans could contaminate it. On the set there was a guy, Ariel, from Rosario, which is the same as having a very, very strong accent. 'Hey, Viggo, let's have mate, okay,' he told me everyday. I wrote to him: 'We'll drink mate all you want, every day, but please don't talk to me unless I ask you to, please, I mean it with all the respect in the world, I'm afraid of you." Even when he's being obnoxious Viggo is agreeable, and a guy like that doesn't need P.R. Holding a glass of red wine and laughing, Agustín Díaz Yanes asserts, "Viggo is terrifying. He sends you a handwritten letter, all decorated and painted, and when he arrives at your house for dinner he's an intolerable guy: he cleans the fish and picks up the dishes. My wife is fascinated, and she compares the two of us. Damn, what's a guy supposed to do? The bar is set very high." After a meal, mate is sacred to Viggo. The beverage is his best traveling companion and his only requirement as a superstar is that there be hot water available so he can drink it. And that's not his only obsession: there's also soccer and his dream team, San Lorenzo. "This year the club is celebrating its 99th and it has had a really good season," he says. Have you managed to get Agustín and Ariadna to drink mate and be "cuervos" (followers of San Lorenzo)? Laughing and in unison, Viggo, Ariadna and Agustín exclaim: "We're cuervos till death!" There's loyalty in the trio headed by Mortensen, whose appearance is deceiving because he sounds as much or even more Latin than his comrades on the set. He's simple and, according to the director, enormously invested in his work. "Some supposedly great stars doubt you and call you and say. 'Man, what are you doing?!' But Viggo went for the kill. He was the first one to throw himself into the cold water, into a filthy mud puddle, and the rest followed him." And the most complicated scene, according to the director, was one where Viggo couldn't move for more than two hours. "He's not like those idiots who get up and give you hell through their agents. We said to him, 'Can you stay sprawled like that on the ground until Ariadna is dressed?' and there he was for 2 hours without complaining." Viggo, it's said that you are obsessive when it comes to investigating your roles. Is that true? "In general, if they give me a lot of time, I do a lot of work, and if they give a little time, I do a lot of work. Over there I submerged myself in the history of Spain, the history of its art. For example, I went to the Prado Museum, which I had visited many times, but now I saw the paintings in a different light, searching for the character, so I'd call Tano (the director) at 2 am and tell him, "listen, I found this phrase by Góngora". 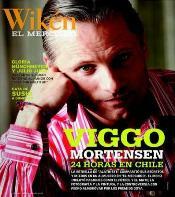 Viggo makes a face and changes his voice to imitate Díaz Yanes: 'Okay, let me explain it to you. You're an idiot.' But nothing. I saw the characters in those painting." In the last few years of his career, Viggo has made movies of widely differing styles. But if he had to choose a kind of golden era for him, he mentions A History of Violence, the not yet screened Eastern Promises (with Naomi Watts), both with director David Cronenberg, and Alatriste and "Tano" Díaz Yanes. What's it like working with such different directors? "It's not really like that. It's not that both directors work in the same manner, but they're similar. Tano started later than Cronenberg. But his point of view, and his way of treating people, they're very similar. They met in Europe during the A History of Violence promotion, and it was the funniest thing to see: they told jokes that were frightening. I ate more than they did, because all they did was talk. And they talked about very strange things. But I think that it doesn't matter if the movie you make is in Spain, has special effects or is filmed in Canada. The directors set the example. People like them aren't afraid of actors' improvising. "Yes, they're mature as people and as artists. They don't see it as a threat when somebody from the cast gets an idea, but they also don't have a problem declaring 'that is the dumbest idea you've had the whole filming and don't ever mention it again.' But they mean well." (He laughs). Did you hear that a lot on Alatriste? "Quite a lot" (he imitates the director again): 'You're the biggest idiot I've seen in my life'. Seriously though, he and Cronenberg have been generous with me." "I just filmed a new English movie and I've been so spoiled with the last three, with Cronenberg and Tano, that I almost don't want to leave, you know. I want to work with them, because I'll be surrounded by good humour and good people. I've made a lot of movies and this is something special. I'm a little scared, as though it were bad luck to leave, (he knocks on wood), these surroundings." You're a painter, poet, photographer and actor. Did your artistic vision grow after the cultural saturation that was Alatriste? "Look, I admired Velázquez before, and I was conscious of his legacy. But thanks to the movie you look at him much more closely. If you make a movie like this and you visit those sites and go inside those places, your responsibility is to look at everything with new eyes. It's not about just being there for one moment. That's why when actors say 'It was soooo difficult to get rid of the character,' you know what I think? That they're mistaken. I don't have any interest in forgetting about anything. Not the good, or the bad, not the easy part or the hard part. Everything I learned from Tano and the others and from the character of Diego Alatriste I treasure."